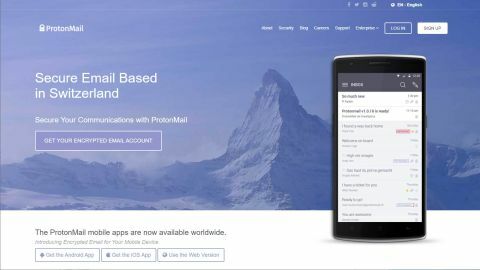 ProtonMail is an alternative web-based mailbox for sending secure communications using PGP, but it comes with a long list of caveats that might put people off signing up. Privacy is a hot top these days, as governments seem determined to undermine their citizens right to it for numerous reasons. For the public, stories that reveal special relationships that Google, Microsoft and Yahoo have with the NSA, and other security services, only fuel their concerns that everything they do online is being read by others for nefarious purposes. ProtonMail is the supposed antidote to compromised email systems. An email service where all communications can be encrypted and messages can even self-destruct. Your mission, should you choose to accept it, is to read this review and determine if ProtonMail is the answer to your privacy concerns or just an extra one. ProtonMail has a free account with a ‘limited features’ that includes 150 messages per day, 500MB of storage and limited support. The first paid level is the Plus account costing $4.00 a month that allows you to send up to 1,000 emails a day, keep up to 5GB of emails in storage, have five email aliases and use your own domain name if required. There is also a business user tier where each employee billed at $6.25 per month to use the service. If you’ve used Google Mail, Outlook.com or anything similar then you’ll not find much about ProtonMail jarring, as it follows a very similar model. There is a recognisable Inbox, you can create folders for specific emails conversations to live, and there are filters to action on incoming emails, and so on. And, for most users, it might initially seem like there is little difference between this email and any other web-based solution. One more useful feature of the system is the ability to make emails self-destruct a specific time after they’ve been sent. We mention this ability because this is the exact feature that the infamous Cambridge Analytica used on ProtonMail to obfuscate its notorious activity in respect of harvested Facebook data and selling it on. However, it only takes one of the parties in these exchanges not to be a ProtonMail user or forward an email, and the game is up, should investigations occur. Given the example of Cambridge Analytics, that you are using ProtonMail will suggest that you’ve something to hide even if you’ve done nothing wrong, and having the system set up to send time-limited emails might only serve to enhance that impression to any law enforcement, should they investigate you. That might seem wildly unfair, but this is the world we live in. There are mobile apps for iOS and Android that provide almost identical functionality to the web version. There is no desktop installable app. However you choose to use it, you can attach files up to 25MB in size or include links to larger files stored elsewhere on Cloud storage. Where it is different is that when you are composing an email, you have the option to encrypt the email with a password that is required by the recipient at the other end to access the message. You can provide them with a ‘hint’ as to what that password might be or send the password by another means. But by whatever means you aim to get them that piece of information, for this to work they must know it. And, they must remember that specific password if they ever want to read that email again. On the paid version of the service, you can associate passwords with contacts allowing them to be automatically reused with each mail they are sent from that point onwards. This situation, as might be expected, is easier if both parties are using ProtonMail or if you use a Public encryption key, but that assumes a level of coordination that isn’t practical or achievable for some. You may be wondering what happens if you forget your password to ProtonMail and are forced to reset it? That’s not a great situation. Because as ProtonMail doesn’t keep a copy of your password (according to them). And, while it can make your account active again, and you can see the emails in your folders, you won’t be able to see the contents without that password. Everything from before the password change will be denied to you, forever. And, the encryption of all mail also has another major downside we noticed. As Gmail users, we often need to refer to an old email, and we usually find that by putting a word we know will be in the contents into the search box. This approach might work with Gmail and most email systems, but not with ProtonMail. It doesn’t keep indexes of the encrypted emails to scan for those words, so searching by contents isn’t possible. For anyone that uses email extensively that’s a major drawback and being only able to find an email by the contact name or with a word in the title is very limiting indeed. The entire purpose of ProtonMail is to be secure, although that does make some restrictions on how you and those you communicate with use it. Sending fully encrypted emails to those not using ProtonMail requires them to have the password as we previously mentioned, and if you intend to send regular emails, it is probably easier to get them a free account to use for the purpose. Encrypted emails never travel or rest in an unencrypted form, and if you activate two-factor authentication, it should be reasonably safe from anyone guessing your password. Much kudos is given on the ProtonMail website of the physical server locations in Switzerland, and how that somehow emboldens them with the ability to resist the legal demands of other countries to provide access to email held on its system. Parallels are meant to be made, we assume, with the Swiss banking system, infamous for keeping the bank accounts of the worst regimes and their leaders from international authorities. However, the Swiss also have information exchange agreements with the likes of the USA, and in that respect, they’re duty bound to hand over data in certain circumstances. It is also asserted that not even ProtonMail can read the emails of its customers, but is any of this believable? ProtonMail claim not to hold the encryption keys that would enable them to unlock the emails, allowing them to hand over the encrypted emails, but not the means to access them. Several hackers have claimed to have hacked ProtonMail, although up till now they have been unwilling to prove it. Until a hacker produces evidence of successfully attacking ProtonMail, then it seems reasonably safe to assume it is a secure system, for now. The performance of ProtonMail is generally good, and we were especially impressed with how rapidly it accepts attachments. What we easily can’t test is if the speed of the system reduces once you’ve got thousands of emails on it, although as you can only see a limited number of emails at any time, it should still be quick. Where it slows down is when you use it in preview panel mode, as each email needs to be decrypted as you highlight it to fill the panel with the contents. Being able to move back and forwards between a view with the panel and another with just the list is important if you have many emails to navigate through, and then click on the ones you need to read. Despite some useful features, there are issues with ProtonMail, and we’re not just talking about bugs or other technical points. While researching this review, we found a significant number of free and paying customers with harsh things to say about the customer services side of this business. One especially worrying trend is customers who for no obvious reason have their accounts frozen. A scenario from which you have no appeal even it accused you of fraud or some other illegality. Once this happens, you can never access those emails again, and from what we understand ProtonMail deletes them all. And for good measure, some paying customers have also accused them of billing irregularities. Any sizable business collects complaints. However, ProtonMail does seem to gather a very high proportion of them compared to accolades, and when multiple users make the same or similar complaints, it can’t be easily dismissed. Because of these concerns, and other performance issues, we find it difficult to recommend using this tool for a commercial purpose. We should also mention that if you install PGP on your computer, and on that of the person you wish to communicate securely, then you can use almost any email system and achieve similar results. And, that costs nothing. Scanning the positive comments made about this business, it is easy to find individuals who want something that isn’t controlled by Google, Microsoft or Yahoo. ProtonMail certainly fits that criteria, but at what cost? But what you gain in theoretical protection from prying eyes you give up in terms of wider security, development, design and software integration.